Helpful sewing any fabric where additional feeding is necessary. To order... Call 1-800-225-2852, in NJ call 1-201-809-2009 today. This ergoomic device is designed to fit on all U.S. Blindstitch machnes. 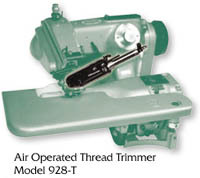 Used with an electronic motor, as shown below, the knee lever is eliminated and the thread is cut simply by helling the treadle. 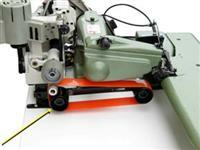 The high quality blade is designed to cut all types of thread. The kit is available on all new machines and can also be ordered separately for installation in your factory. State model number of machine and motor when ordering. U.S. Blindstitch Utilizes only the highest quality motors available.